The American Telugu Association (ATA), an umbrella body of the community in the United States, has held its board meeting at the Bellagio hotel in Las Vegas, Nevada on Saturday Jan 14th. 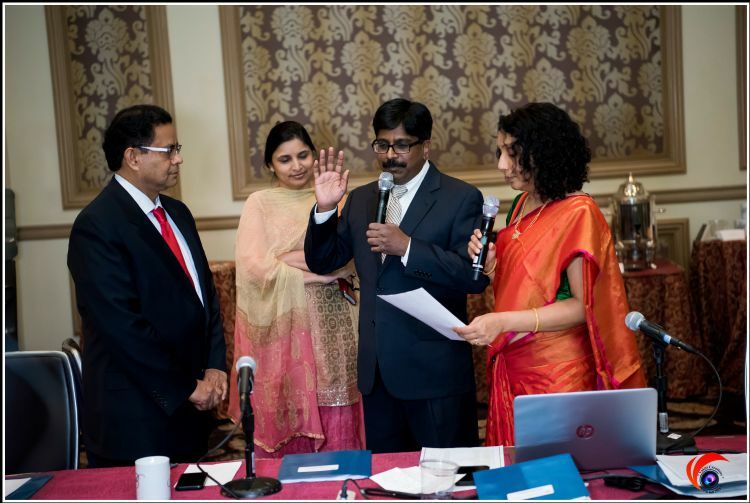 Karunakar Asireddy was sworn in as the new president of the organization. Aside from the ATA board members, standing committee Chairs, Regional Coordinators and prominent Telugu community members from across America attended the meeting. In all, more than 200 delegates came from across the US. Incumbent President Sudhakar Perkari passed on the baton to the new president. Along with Asireddy, a revamped board of trustees has also been installed. ATA unanimously elected 13 of its board of trustees (BOT) from different categories: Bhuvanesh Boojala, Parashuram Pinnapureddy, Vinod Koduru, Jayanth Challa, Krishna Dyapa, Ravinder Reddy, Raghuveer Bandaru, Murali Bommanaveni, Soumya Kondapalli, Kiran Reddy Pasham, Raghuveer Reddy, Rinda Kumar Sama, Sharat Vemula. All members of BOT took the oath and promised to uphold the ATA constitution and bylaws. The new trustees will be in place for a four-year term beginning this year (2017-2020). ATA new board has elected Parmesh Bheemreddy as President-Elect in a unanimous vote and he will serve as President for 2019-2020. President Karunakar Asireddy, in his presidential address, noted that ATA, as an organization, continued to remember its main mission: to preserve and maintain the heritage of all American Telugus; to promote literary, cultural, educational, religious, social and economic activities of the community, and other aspects as mentioned in the ATA charter. He unveiled the new committee's vision and plan of action for the next two years on counseling on immigration and jobs for students, skill enhancement training for ATA members, free online SAT training and college admission counseling for high school students, Medical/Dental camps for visiting parents, expanding emergency services for Telugu community.